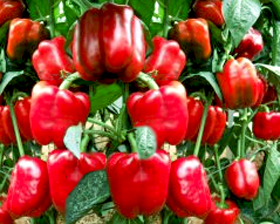 This is an Italian variety of giant red bell pepper. Beautiful and blocky, with very thick walls, the flavor is outstanding – sweet and rich! Sow seeds March to April. Place seeds on the surface of a free draining compost and cover with a fine sprinkling of compost or vermiculite. Place in a propagator at 18-21C until after germination, which takes 7-10 days.